I have always loved sauerkraut. It must go back to something in my DNA and German heritage. My paternal granddad was from the old country and he passed away long before I was born. I remember eating sauerkraut as a kid with hot dogs. One of my favorite memories was stopping at the Der Wienerschnitzel drive-thru and getting a hot dog in a bun smothered with sauerkraut and French's mustard. As I got older, my taste grew more refined and I started to enjoy bratwursts and German mustard, or pork chops smothered with sauerkraut. When I lived in the State, I only bought the kraut in a jar, or a can, because it was just too easy. 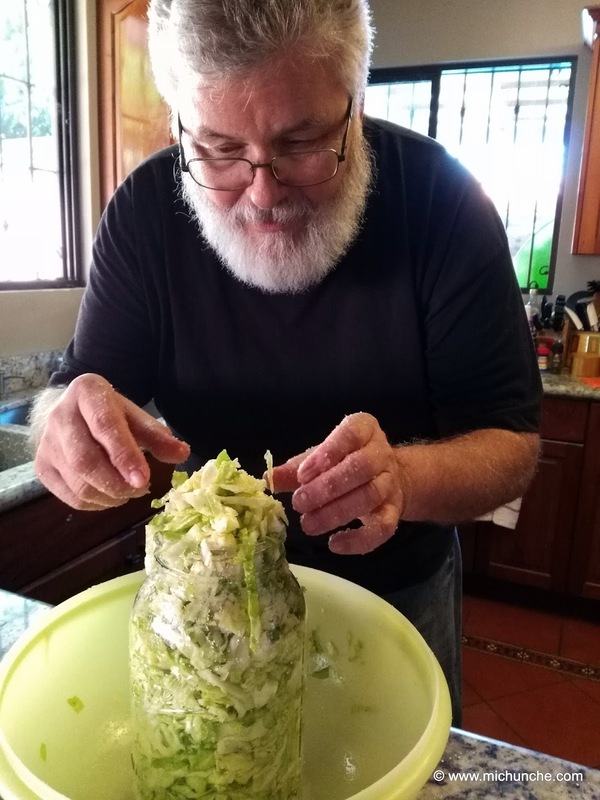 You can buy sauerkraut here in Costa Rica, but it's not carried by any of my local supermarket. Who knew this German staple is so easy to make? All you have to do is plan ahead and have cabbage and salt on hand. I found this recipe on thekitchn.com, and have tweaked it to our taste. Cabbage (about 3 pounds after removing the core) Note: You can use any type you like; green, Napa, red, etc. Weights to press the cabbage down. This can be a small jelly jar filled with clean rocks, marbles, or other weights, that will fit inside the wide-mouth jar. I have special glass fermentation weights that work well. 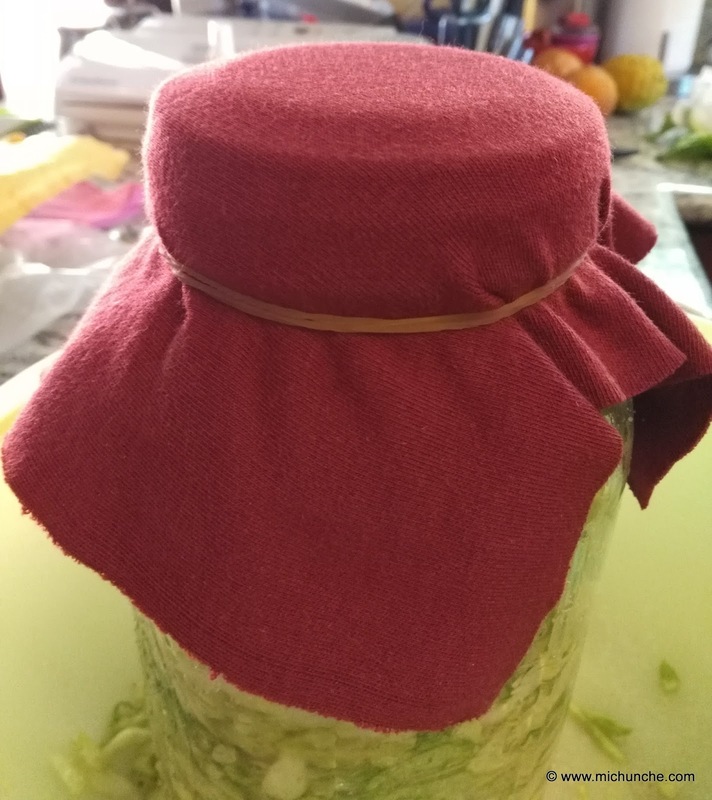 Cloth for covering the jar. I use a piece of an old cotton jersey t-shirt. Rubber bands or twine to secure the cloth on the top of the jar. Discard any wilted, or limp outer leaves of the cabbage. Gently peel off one or two of the large outer leaves and set them aside. Cut the cabbage into quarters. Remove the core from each section. Slice each quarter into thin strips. Don't worry if some pieces are larger than others, it will just give more texture. Mix the cabbage and salt in a large mixing bowl with your hands for about 5 to 10 minutes. If you want caraway seeds, now it the time to add it to the mix. You can also mix in a little shredded carrot and diced garlic to change it up a bit. As you mix the cabbage will start to become limp like coleslaw. 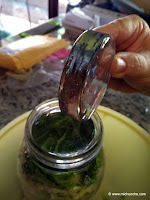 Take handfuls of cabbage and fill the jar(s). Keep pushing the cabbage down. It will look like the jar(s) is too small, but just keep pushing it down until it fits. If there is any salty liquid left in the mixing bowl, pour it on top. Now, take the large leaf of cabbage you saved in step 1, and place it over the top of the sliced cabbage. This help keep small pieces from floating to the top. Place the weight on top of the cabbage. This can be the small jelly jar with clean rocks or marbles, or the glass fermentation weights. 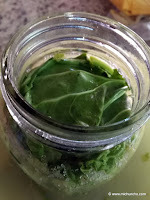 The weight will help keep the cabbage submerged in the salt brine so it can start to ferment. Cover the mouth of the jar(s) with a clean cloth and keep it in place with string or a rubber band. Over the next 24 hours, press down the weight every couple of hours to compress the cabbage as it releases the liquid. It is important to eventually get the cabbage totally submerged to prevent bad bacteria from growing. If the cabbage is not completely submerged within 24 hours, mix a teaspoon of salt in a cup of water and add enough to submerge it. The fermentation process will take anywhere from 3 to 10 days. Keep the jar(s) away from direct sunlight in a cool place if possible. A pantry shelf or kitchen cabinet is ideal. After 3 days, start tasting the sauerkraut everyday. When it's to you liking, you can take the weights off, put a regular lid on the jar, and store it in the refrigerator. There's no rule for when the sauerkraut is "done". It's all a matter of taste. During the fermentation process, you may see bubbles in the jar, foam on the top, or white scum. These are all good signs of healthy fermentation. You can remove the scum before refrigeration. 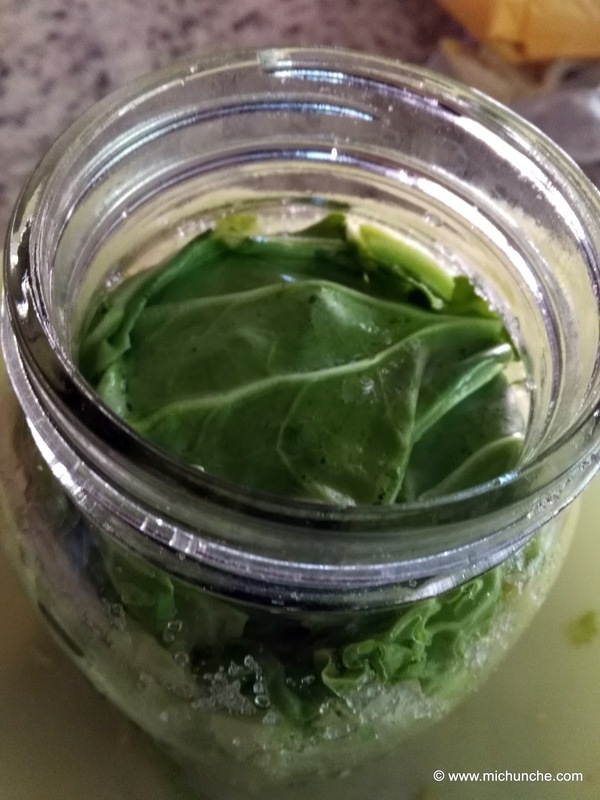 However, if you see any mold, skim it off immediately and make sure the cabbage is totally submerged below the brine level. If you find moldy particles close to the surface, don't panic, just discard them. The rest of the sauerkraut is fine. Sauerkraut will keep for at least two months and often longer if kept refrigerated. If needed you can transfer the sauerkraut to smaller jars for storage.